Headed West - 2nd singlehanded sail in Lena. Gaining a lot more confidence in handling the boat - and it can be more awkward in very light winds. Not so bad if you do mess up though. I was struggling here with a very light, 5 kts at the most following wind - which was useless - so I headed S towards Burham and DZ1 buoy - since I really want to get some pics of buoys ! By the time I was alongside DZ3 - 3 miles from Watchet - and 15 m on the log from Uphill - I began to seriously access the situation. 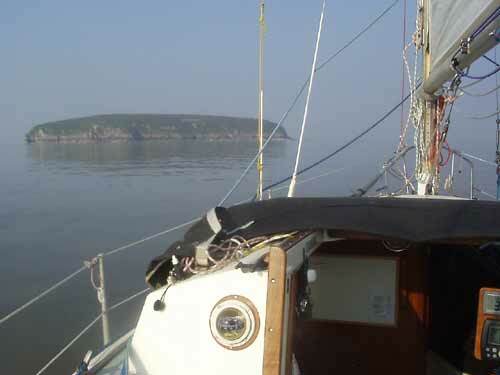 Dead calm - bad vis - ( at DZ3 I couldn't see any coastline, no Steep Holm - not even Hinkley Point Power Station - all a bit eeirie, and the tide would still be running SW until 4 pm - I had to be in the Axe for 7.30 pm ( just enough water ) 8.00 pm more or less dusk. 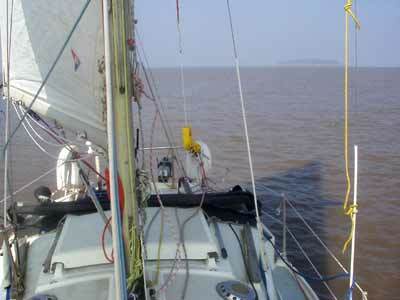 So decided prudently to head back on a direct bearing to my waypoint 5 - half mile SW of Steep Holm. No wind at all now - so nearly six miles against a 1.7 kt tide. Pottered along running at half revs, about 4 and a bit kts on the speed log - about 2.8 on the gps. If I'd have swanned around any longer, I would have been another three or four miles downtide. On the other hand, I didn't want to be too early. Getting the hang of my autopilot - its an old TP 1600 - good size for the boat - but it works a treat. Kept me spot on on 60 deg T on the gps track - while I made a coffee, had an orange and nice plum, and rolled a few cigs - Easter Sat - and a bit of the planet all to myself. Listening to that engine for an hour or more - with no wind - made me feel I would like a spare engine of sorts - even though it is running great. Maybe a 5 hp of some sort hung on the back. Tides are fierce here - if this had been more of a spring I would have been in 3 kts for the best part of three hours here. By the time I was past Steep Holm again it was nearly 6 pm - and really dead flat. You can see the haze. Dropped the main and tidied it up a bit, to save later - and just let her drift, while I made up my log in the cockpit from my hourly whiteboard notes. I actually managed to plot my position on the chart every hour as well - pleased about that. I've got a whiteboard, so as I can jot down the position, bearing, log etc every hour in the cockpit - then when I have a chance, pop below and mark the position on the chart. I'm finding the new Admiralty folios are good in that they are gridded every minute of degree - so its easy to pop a positon on by eye - a shame the leisure sheet ones are not the same. I've got both for this area anyway. I bought three Stanfords recently as the three cover all the way around to Plymouth - with good inset details as well. I wonder if those will be used this year ! Got the sprayhood dropped here - it goes up and down very easily and I find it much better for visibility. Had it down all day. Great day out - even if I did make a right pigs ear of getting on to the mooring - its really not easy early on a rising tide. All good experience. Great day - significant step in my sailing. Good early start to the season as well - though I could have got her out on a few occasions this year. Geoff - well chuffed !